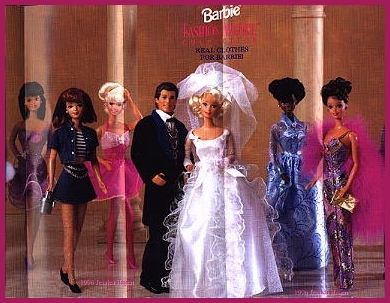 A web site devoted entirely to the hobby of Barbie doll collecting! This year Barbie doll will look smashing in her brand new Fashion Avenue outfits. Here's a glimpse of four of the new fashions. The new Fashion Avenues are currently showing up in stores. To view pictures of the new fashions, click on the picture at the bottom of this page. CLICK ON PICTURE TO VIEW THE NEW FASHION AVENUES. Here's a picture of the poster thats included on the booklet with the new Fashion Avenue outifts. The purple party dress on the left isn't pictured in the booklet and neither is the blue evening gown. I hope Mattel continues the Fashion Avenues every year! This page has been visited times since 3/6/96. Copyright© 1996,1997-Jessica Hagen. All rights reserved. Barbie® is a registered trademark of Mattel, Inc and I am in no way affiliated with Mattel. All other trademarks are copyright of their respective owners. This page was created in March 1996.